Each video in this how to start a business online series acts as an affiliate marketing guide for beginners and experts alike. 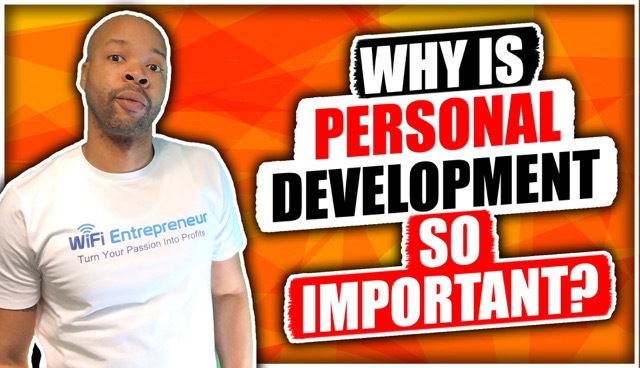 If you’re looking to grow your business online, check out this video on why personal development is so important , but be sure to watch the rest of the videos in this how to series when you can. What’s going on guys? It’s Tre Mathis from wifientrepreneur.com. So glad you guys landed on my page here today. It’s a beautiful day here in Martha’s Vineyard, Massachusetts. I’m a little bummed out today, I’ll tell you guys why in just a moment. Today is Tuesday, January 12th and this is the Wi-Fi Journal. So what’s been going on, guys? Like I said before, it’s pretty hectic day to day. I’m happy to be shooting this video though. Hectic in the sense that this morning, man, I had to go to the post office. I know you guys are definitely wasn’t thinking that’s what I was going to say when I was saying I had a bad day, but I don’t know if you guys have ever tried to go to a post office on an island, But it’s a lot challenges, people definitely on island time. You’re doing your own thing. So we had some challenges this morning. And in those challenges, I thought to myself, “Man, I’m so frustrated by this and that and the third. And as I always share with you guys, I thought about not shooting the video. I think that’s very important to share because of the fact that I know as you’re building your business, you’re going to meet a lot of challenges if you will, and you’re going to be asking yourself, “Man, I really don’t feel like doing this.” But you have to know that it’s in those times that you definitely have to do. You definitely need to build up that courage to to get it done. So here I was today, I went to the post office, has some challenge, just got a little frustrated, thought to myself, “Man, I don’t know if I’m going to do this video today.” But then I thought to myself, “How am I going to let someone at the post office influence my day in a negative way and take me off of my game, pull me away from the goals in which I have set for myself and for my family and for my business? Am I going to let someone who may be dealing with challenges, maybe with the government shutdown that we talked about in the last video? They could be dealing with some\ of their own financial challenges, or could just be on island time having a great time and just didn’t feel the need to help me today. Nonetheless, I have to look at myself and help myself, which also makes me think of the story, actually. I don’t know if you guys know that I’m a part of toastmasters group in Washington DC. And in the group, every so often, we were required to give speeches. And one of the speeches that I gave here recently was called Who Motivates the Motivator? And that speech really resonates with me. I wrote it. But it really resonates with me because of the fact that, oftentimes, we have to really look ourselves in the mirror and say, who’s in charge of motivating me? There’s a lot of great motivational speakers out there. I plan to be one of them that. Well, we had some greats already out there, live Mr. Les Brown. We have another one, Gary V. He’s a great new up-and-comer. He’s not really up-and-comer; he just took a while, for the overall community to work and you need to catch onto him. But there’s some great motivators that can really get you going, get you fired up. And at the end of the day, when you cut out their video, you have to do to work. At the end of the day, when things don’t necessarily go exactly how you plan, you have to build up the motivation to kick into action, to do the things that you know are necessary for your success. You can easily fall into sitting on the couch, watching Netflix, and doing nothing, but if you do nothing, you will get nothing. So you have to dig deep, dig with inside of yourself and say, “I have to do this. This video was something that I had to do.” If you know that you’ve been thrown off your game in the past, where you felt like you know you need to do something, but someone says something, or someone did something, and you just basically let that whole 24 hours go, and just like that whole day go. I encourage you to think of this message when you move forward the next time that happens, and remind yourself that you’re in charge of you, you motivate you and you have to do what’s necessary to reach those goals that you desire. That comes from the personal development aspect of life. And that’s why I made sure that personal development was one of the first things that are feature on wifientrepreneur.com. Without true solid personal development, or a foundation and what’s necessary from you within side, before you start to go out there and properly affect the marketplace, before you go out there and able to make an impact in the world, you have to work on you first. So that’s why personal development is one of the first things that you’ll see when you visit wifientrepreneur.com. It’s actually a post that we did not too long ago about why personal development with so important. I’m going to put a link to that article at the bottom of this description. And if this is your first time watching our videos, I thank you guys for checking us out. If you’re watching this on Facebook, please go ahead and subscribe to our Wi-Fi Entrepreneur page.